We have three rooms... the Jordan Baker room is upstairs immediately to your left, the Nick Carraway room is upstairs at the end of the hall, and the Daisy Buchanan room is downstairs adjoining the entrance parlor. You'll have a lock on your door and a private bathroom with a shower inside your room. I wash ALL the bed linen, even the blankets and bedspreads after each guest stay. I also sanitize the entire bathroom, doorknobs and all cleanable surfaces after each guest stay. You may join us for conversation, or have the privacy of your room or separate living room. The entire house is non-smoking, however you may smoke in a designated area outside. 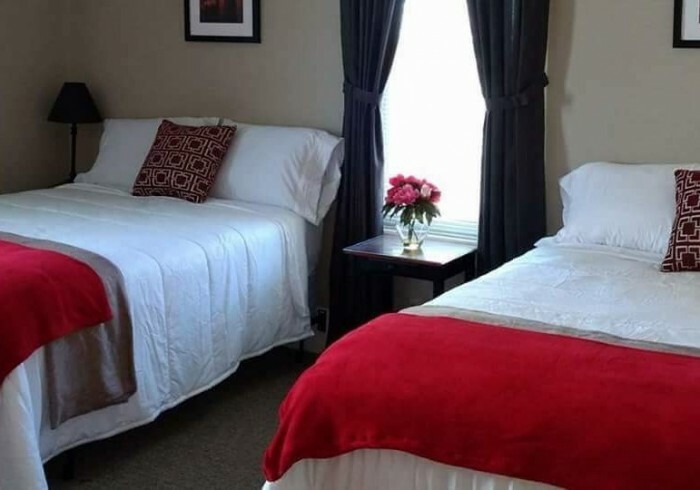 Once you're checked in, you may have access to the parlor, downstairs half bath, the stairs, hallway and your private rooms with your private bathroom with shower inside your room. You may also enjoy all of the large yard and two patios, both with patio tables, umbrellas (in season) and chairs. A large parking area is available for folks with larger utility vehicles or trailers. Myself, Marc, daughter Jennifer, or son-in-law Matt, will be available to offer recommendations and be available when needed. If we have plans for the evening, we will still be available by phone. When at home, we have a family room separate from the living room if you want privacy, but we're always available to socialize if you prefer.